RedoxFat Slimming Capsule was relaunched last December 1, 2011 at Wheatberry Bakery and Cafe. It also coincided with the contract signing of its newest brand ambassador Iya Villania. RedoxFat Slimming Capsule Relaunch and Contract Signing with the unveiling of its newest brand ambassador Iya Villania. In photo (Left-Right): ALV Talent Circuit Inc. Talent Manager Arnold Vegafria, RedoxFat Endorser Iya Villania, ATC Healthcare President Albert Chua, ATC Operations Manager Carmelo Espiritu, and ATC Marketing Manager Kathleen De los Santos. Miss Iya Villania embodies the lifestyle of Redox target consumers. She manages to stay in tip-top shape despite her demanding schedule as an actress, total performer, host, VJ and product endorser. 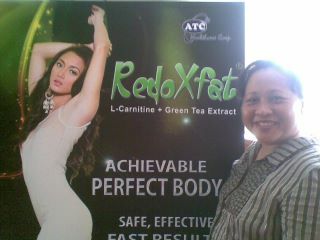 As such, Iya is the best choice to be RedoxFat’s endorser. Iya Villania, together with expert Guru Coach Chappy Callanta and wellness advocate Dr. Marthony Basco, gamely answered questions on how this new food supplements can help better lives. They discuss its health benefits, citing Iya as an example. RedoxFat Slimming Capsules has seven times more L-Carnitine than other leading brands- an amino acid known for fat breakdown and muscle development. As a naturally occurring amino acid which plays a vital role in the metabolism of fat, it functions as a transporter of fatty acids into the mitochondria, the metabolic furnace of the cell. Weight loss supplement - Reduces fat mass, increases muscle mass, and reduces fatigue. The capsule is made even more powerful with Green Tea extract that assists in weight loss, lower cholesterol levels, and release energy channels. This supplement is all 100% natural and had passed the Bureau of Food and Drugs (BFAD) quality control standards. One blister pack of RedoxFat has 30 capsules and should be taken as a dietary supplement. One can take 2 to 3 capsules a day, after meals. RedoxFat Slimming Capsules is available in leading pharmacies and wellness centers nationwide. In addition to RedoxFat Slimming Capsules, ATC has a comprehensive line of healthcare supplements in softgel form: Aloe Vera, Calcium with Vitamin D, Coenzyme Q10, Fish oil, Evening Primrose, Garlic Oil, Ginkgo Biloba, Ginseng, Grape Seed, Lecithin, LiverMarin, Lycopene, Glutathione, Royal Jelly, and Spirulina. For more information on ATC Healthcare products, call 749-4542 or 743-5183, or visit www.atchealthcare.com.ph. You can also drop them a line or two at atchealthcare@yahoo.com.ph.